ABSTRACT: An evolutionary scenario for the evolution of language, beginning with handedness, gesture and pantomime, then propositions and speech, resulting in an all-purpose symbol system capable of expressing any proposition. Steklis, H.D. and Harnad, Stevan (1976) From hand to mouth: Some critical stages in the evolution of language. In, Harnad, S, Steklis, H.D. and Lancaster, J.B. (eds.) Annals of the New York Academy of Sciences. 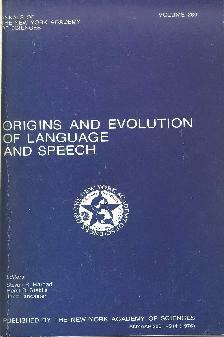 Origins and Evolution of Language and Speech New York Academy of Sciences, pp. 445-455.